Ideal for groups wanting a simple, warm and dry place to stay. Stay in our cosy How Stean Bunkhouse - No need to put up tents! Affectionately know as 'The Posh Tent'. 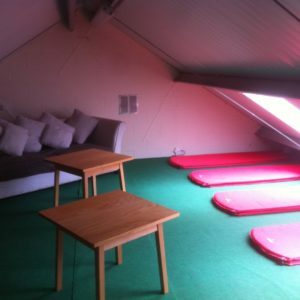 The How Stean bunkhouse offers basic sleeping accommodation for up to 16 people in two adjoining rooms. The posh tent has proved to be very popular with a wide variety of groups just wishing for somewhere simple, warm and dry. We know that putting up a tent at a campsite can be a hassle so this brilliant accommodation makes life easy for you, but without paying the usual price of accommodation in the Yorkshire Dales! Even if you aren't planning to use the brilliant activity options that are available with How Stean Gorge, this still makes the perfect place for a camping holiday in Yorkshire, but without the hassle! Booked two nights in the bunkhouse above the shower blocks for 11 of us on a stag do. We did the big 5 and then had a BBQ and fire. It was absolutely perfect - everyone had a great time, the food was lovely and all staff very friendly. There are sleeping mats and a couple of comfortable sofas available but you will need to bring your own sleeping bag and pillows to make yourself comfortable. You will have full access to all the facilities that the campsite has to offer, such as toilets, kitchen and more. You will also be in the perfect location to explore the picturesque Yorkshire Dales from the doorstep of your accommodation. All groups staying at the How Stean Bunkhouse, will have sole occupancy for the duration of there stay. £10pp per night with a minimum booking of 10 people. 2 nights minimum during the weekend. Book online here or call 01423 755666 to speak to a member of the team. If you require more space or self catering facilities please take a look at Scar House Bunk Barn. If you have a larger group that we can't accommodate in the 'the posh tent' or Scar House Bunk Barn, we have numerous quality troop tents available for Hire. These tents will be erected for you prior to your arrival, on our 3 Star camping park and include inflatable sleeping mats. How Stean Gorge, Lofthouse, Pateley Bridge, North Yorkshire, HG3 5SY. We are walking distance of Lofthouse and Middlesmoor villages. How Stean is approximately 21 Miles Harrogate, 40 Miles from York and 33 Miles from Leeds with access to the A1 about 30 mins away. From Ripon take the B6265 to Pateley Bridge. After crossing the bridge turn right onto Lower Wrath road (Upper Nidderdale). After 8 miles you will enter the village of Lofthouse, continue to follow brown and white How Stean Gorge tourism signs. You will need sleeping bags, pillows and your own toiletries and towels. A cooked breakfast is available at How Stean Gorge cafe. If you are taking part in any outdoor adventure activities you will need suitable clothing to prepare for your chosen activity.